When you code, what do you review? One myth that is prevalent in home health is that the nurse must chart on the primary diagnosis. This is a good rule of thumb but it is not a law or anything. You will not go to jail if you venture off into another relevant area of patient care. These are some of the errors we see because the focus of the nurses and coders is narrowed to the ‘primary diagnosis. The patient is on multiple medications for hypertension but miraculously the patient does not have a diagnosis of hypertension anywhere. A poorly chosen primary diagnosis makes it to the initial plan of care and the obedient nurse documents on it throughout the episode. When it comes time to code the second episode, the coder reads through the notes and determines that most care went to the bad diagnosis and re-codes with the same error. We continue to see low vision coded without a supporting diagnosis that cannot be corrected with lenses. Hospital paperwork mentions diseases and conditions that are nowhere to be found in the home health care chart. So, back to the original question. What are you reviewing? If you are looking a the diagnoses that the nurse wrote on her assessment and simply applying the coding conventions, you need to find out where she is getting her information. If she is repeating the same diagnoses as before, they may be wrong. If there are no changes, the patient appears to be static to the Medicare computers that run edits on your claims placing you at high risk for scrutiny. Coding that is compliant with all regulations doesn’t happen in one place. The clinician must document accurately regardless of the coding sequence was at the beginning of the episode. If necessary, complete a Significant Change in Condition Assessment. Alternatively, if you believe that the coding was performed incorrectly, contact the person who does your coding and make clear why you think it is wrong. Medicare expects you to code accurately but they do not expect you to be clairvoyant. If your patient with diabetes as a secondary diagnosis has a sustained blood elevated blood sugar, it should not be ignored in the notes. When the visit note content is a true and accurate reflection of the patient and you have all the supplemental information such as lab, hospital documents, etc., then true and correct codes may be assigned. Coders need to learn to look for clues that the documentation isn’t as it should be. Initially, this may delay dropping a RAP for a day or so but it is better than leaving hundreds of dollars on the table or putting yourself at risk for denials. Good coding will eventually be the starting point of a more efficient process which will result in your agency fine tuning multiple processes improving patient care, communication and cash. What’s wrong with that? 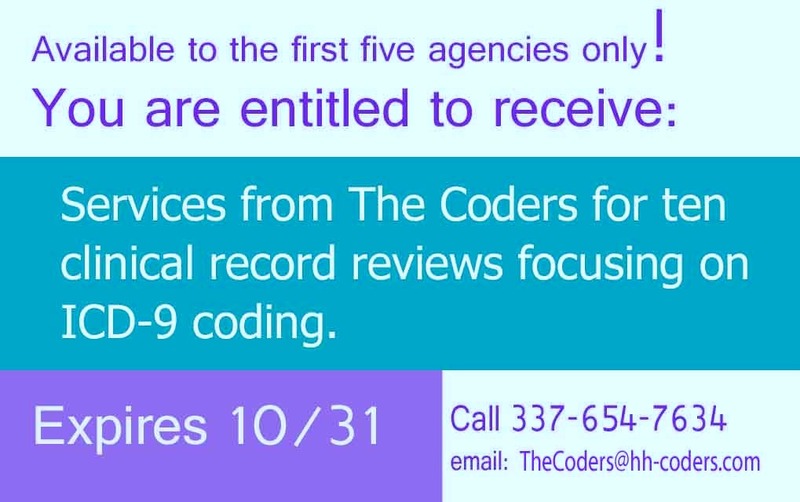 If you need help coding or billing, don’t hesitate to give us a call. We can help you get your processes streamlined and improve your cash. See the coupon below for a special offer for the first five readers who respond. As always, we listen and take to heart what others are saying. There were many legitimate points made by our readers regarding the layout of the quiz. Honestly? It was the first one listed and we had no idea it would be that difficult to read. The question about bathing has been taken off the quiz. Many of you found it very difficult to understand so it has been removed. I have also reset the quiz to show the results against my better judgment. For those of you who have already taken the quiz, you can find the answers Answers. Let me know if it doesn’t work. Day of assessment is defined as the 24 hours immediately preceding the home visit and the time spent by the clinician in the home. If the patient’s ability or status varies on the day of the assessment, report the patient’s “usual status” or what is true greater than 50% of the assessment time frame, unless the item specifies differently (e.g., for M2020 Management of Oral Medications, M2030 Management of Injectable Medications, and M2100e Management of Equipment, instead of “usual status” or “greater than 50% of the time,” consider the medication or equipment for which the most assistance is needed). Most times, the definition of the time frame will not change the answer but it can change it dramatically in some situations. Patient 1 is scheduled for a recertification visit on day 56 of the episode. His wife calls you the day before and asks if you can reschedule for the following day because Pt. 1 is having major dental work. When you arrive on day 57, you learn that he was heavily sedated and in a great deal of pain for most of the prior day. He took a pain pill before going to sleep and woke up better. Currently he using Advil to control his pain and he is awake and alert and at no risk related to the oral surgery the day before. Patient 2 is admitted after a cardiologist calls your agency. Patient 2 was out playing golf yesterday and had a cardiac cath this morning. His physician found a greater degree of heart failure than he anticipated and the patient was a very difficult stick. He has a moderate hematoma at the insertion site and the physician asks if you could please admit the patient as soon as possible. You arrive at the house late in the morning just as the patient is arriving home from the cath lab. Can you see how the definition of ‘day of assessment’ would affect the responses to each of these questions? When referencing our beloved Chapter 3, the instructions do mention that if ability varies, consider what the patient is able to do greater than 50% of the time. Chapter 3 does not go on to clarify what a day is. We are supposed to know what a day is. So, pull out chapter 1 and have a look and meanwhile, I pulled out question 10. Let me know if you still have problems with the layout.